I suspect that many people doubted that following “Whiplash” up with a song and dance musical would result in a box office hit. Thankfully they were all delightfully wrong. Released last month, La La Land has already won the Critics’ Choice Movie Award for Best Picture, was among the American Film Institute’s top ten films of 2016, and swept the Golden Globes with a record-breaking seven wins including best picture, screenplay, original score, and original song. I absolutely loved the film and was excited when Justin kindly agreed to speak with us again. 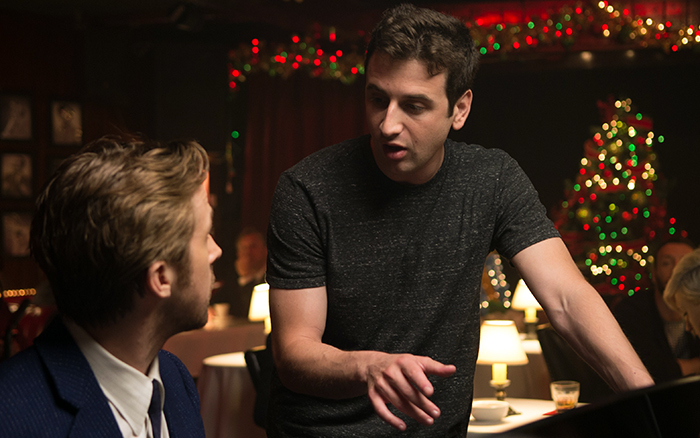 When did you and Damien first conceive of “La La Land?” What remains from your initial ideas? During college, Damien and I made a low budget film musical called “Guy and Madeline on a Park Bench.” We took it to some small festivals in 2009 and 2010, and some people who saw it encouraged us to make another musical — something bigger and better. Damien asked me in 2010 if I wanted to do another musical. I said yes, and he started writing the story in early 2011. Pretty much as soon as he started working on the treatment, I began composing music. From the very beginning, Damien’s story had most of the major elements that are in the movie: It was set in LA. It was a love story between an aspiring actress and a jazz pianist. It started with a musical number on a gridlocked freeway. It had a gravity-free dance in the planetarium. It ended with the “fantasy ballet” sequence. The script got reworked a lot over the course of the five years leading up to production, as did the music, but the major moments that are in the movie were in Damien’s first treatment. You previously described your initial workflow on “Whiplash,” where you’d send Damien .mp3 files of piano demos via email. Was the process similar this time? Yes, the beginning of the process was the same, which was me sitting at the piano, working through ideas, and sending off an insane amount of piano demos until we felt we had the right melodies. What’s different is that when we spoke about “Whiplash,” I mentioned never using a DAW, whereas with “La La Land,” I had to become somewhat proficient with Logic. For the big production numbers that needed to be playback tracks on set, we needed advanced, realistic mockups, so I orchestrated those songs in Finale, and then fed the MIDI parts into Logic. I did actually orchestrate first before making the mockups because I didn’t want the mockups to be sketches; I wanted them to have as much detail and nuance as possible, so I felt I needed to put it on the page first, and then use the orchestrations to make the mockups. During pre-production, I had the help of our executive music producer and his team to program the mockups from the orchestrations. Once I got to scoring the movie in post-production, I was on my own with Logic, working with Damien and the picture editor Tom Cross at the editorial offices for about eight months while they edited. They didn’t want to cut to temp music, so I sat in an office next to the editing room while they fed me scenes to score. When possible, I tried to orchestrate before making score cue mockups, but there were many days where they needed a cue quickly, so I had to learn to actually write in Logic. I’d then go back and make the proper orchestrations later, which I guess is the normal order of things. Like I said, Damien’s very first treatment had an opening musical number on the freeway. We had a demo back in 2011, before we put the project down and made “Whiplash.” When we picked “La La Land” back up in 2014, Damien and I thought we could do better, so I started over on the song. I was composing based on the description Damien had written in the script: a song sung by dreamers who have come to LA to be actors or writers or singers, who are optimistic about their chances, but have been too often beaten down by failure. It was an emotionally complex idea, balancing the joy and excitement with the pain, and this song took me longer than most to compose. How did you collaborate with Pasek and Paul (lyricists Benj Pasek and Justin Paul)? After figuring out the basic melodies, I went back and forth with Damien on more piano demos, figuring out how to structure the songs. What’s the verse, what’s the chorus? Is there a bridge? Once we felt like we had a solid piano demo of a song, I handed the demo off to Pasek and Paul, who brilliantly wrote all of the words. It never ceased to amaze me what they were able to do – narratively, emotionally, etc – with set melodies and a finite number of syllables to work with. There were a couple of times where I asked if, for a given part of a song, it would be easier for them to write the words first and have me set them, but they wanted to write to the melodies; they really embraced that challenge. Some lyrics, “Another Day of Sun” in particular, went through many revisions, and each time they’d come back with an entirely new lyric that set and sang perfectly to the melody. It was incredible. They have such a gift with language. “Mia and Sebastian’s Theme” is crucial to the film. No pressure there. Where did this piece originate? Did it undergo a lot of changes? Like most of the material in the movie, it took me a very long time at the piano, and many piano demos. For this given theme, Damien and I really liked #16. We thought we had it, but after living with it for a week or so, we decided we could do better. I went back to work and kept going until #31, which Damien flipped out for. It was clear to both of us that #31 was the one. The first few phrases were good in the early versions of #31, but from there it didn’t develop quite right, so I kept tweaking how it unfolded. A later, more developed version of #31 became the final demo, at which point we knew we had it. This was 2011, and the theme never changed after that. Are there parts of Sebastian’s life that are drawn from your experiences? Damien brought the film’s producers Fred and Jordan to my apartment in 2011 to meet me, and Fred and Jordan were struck by the fact that I had no furniture – just a bed and a piano. Damien incorporated this into the script, making Sebastian’s apartment just as austere. When we were prepping the movie in 2015, the production designer, set decorator, and costume designer came over to my apartment to see for themselves how I lived (by then I had a little more furniture than I did in 2011, but not much). They were planning to model Sebastian’s apartment somewhat on mine, but when Ryan got wind of what they were thinking for his character, he pushed back, feeling that the character would come off as too sad. They made Sebastian’s apartment a little less barren, and I’ve spent the last two years buying more furniture so that Ryan Gosling won’t think I’m pathetic. Do you have a favorite musical moment in the film – or something you’re particularly proud of? I’m very proud of the song “Audition (The Fools Who Dream).” I’m proud of the composition and orchestration, and what Emma brought to it, performing it live on set with all that raw emotion, is incredible. “City of Stars” is another favorite song of mine. I‘m also very proud of a lot of my score cues. “Bogart & Bergman” and “You Love Jazz Now” (which can be found on the Original Motion Picture Score album) are two of my favorites. Can you talk a little about when you tried to evoke different eras, and when your goal was a more timeless feel? Aside from the jazz combo pieces which were designed to sound old fashioned (1930s-1950s), the only song that’s willfully old-fashioned is “A Lovely Night.” I used the big band brass to punctuate in between the vocals, and the other sections of the orchestra in pretty traditional ways. During the dance section, the arrangement gets more eccentric, but during the song I was trying to give a little bit of a wink to Astaire/Rogers. The rest of the songs hopefully don’t sound like they’re from any particular era. The walking bass and swing drums in “Another Day of Sun” and “Someone in the Crowd” are the kind of thing Michel Legrand did in his 60s musicals, but what’s going on in the orchestra is hopefully new texture and color, unlike stuff we’ve heard. In the case of those two songs, I was just trying to make them fun, packing them with lots of counter melody and counterpoint. I orchestrated “Audition (The Fools Who Dream)” to be lush and romantic, full of highly divided and textured strings parts with lots of suspensions and inner movement. That song also has more impressionist sections full of woodwind trills and buzzy Harmon trumpets. When it came to the underscore, I was thinking about making cues that worked emotionally first and foremost, and but also trying to make them colorful and whimsical where appropriate, with things like wind trills, lots of counterpoint, pitched percussion, and strange interlocked voicings of different instruments. What composition or orchestration lessons have you learned over the years? Sometimes less is more. My instinct has sometimes been to pack my music, in the interest of having more music or trying to be clever, instead of just letting it breathe. Can you talk about Mark Graham’s role and what kind of interaction you had with that team? Mark Graham led the team of copyists. I put all of my Finale files in a Dropbox folder for them, and they took the files to extract and format the parts. For some of the wider cues, they reformatted the score a little bit to fit and look better on the page. At the beginning of the process, Mark gave me some grief for things like using dotted quarters instead of quarters tied to eighths, so I got with the program and made the adjustments. It’s good to learn what the players prefer to read. Before we got started, he also asked if the scores and parts could be without key signatures (which I had no idea is common in film scoring) but I couldn’t accommodate that because I’ve never read music that didn’t have a key signature, and it would have been too disorienting to try to follow along to my own music. We went with transposing scores, and parts with key signatures. Mark sat next to me in the sessions, and was incredibly helpful. He has an amazing ear, and spotted a few instances of wrong ink. Joe Zimmerman sat out in the room with the musicians and was a huge help as well, keeping everything organized. What was your role in the recording sessions? Have you worked with Tim Davies before? I had not worked with Tim Davies before. He’s great. Tim conducted, while I sat in the booth with Damien. Damien gave his thoughts to me, and then I gave notes usually to Tim directly, but sometimes to the whole orchestra. On a couple of occasions, I wanted to change a voicing, and had to run out to the piano to try something. With crunchy chords, sometimes the only way for me to know what it should be is to grab it on a piano. What kind of input will you have on a songbook? Who will publish it? I just looked through a draft a couple of days ago. It’s being put out by Hal Leonard. They did a great job, not just transcribing dense music, but also making smart musical choices. I had some fiddly notes – things like the positioning of chord symbols, how to make the walking bass lines a little more piano-friendly, and making sure that when they chose to put counter melodies in the piano part that they resolved correctly and didn’t get stranded. I think they did terrific work and the songbook should be fun for people to play. Artists often hope that their latest project will be a smash success. Scenes in the film illustrate examples of this hope fulfilled and unfulfilled. When did you first get a sense that “La La Land” was going to be among the former? We started showing the movie to film festival audiences at the end of August and beginning of September. Audiences connected with it, which was a huge relief and incredibly fulfilling. Before a real audience sees the finished film, you just don’t know. I thought I’d end our interview with Justin as I did last time, asking him what’s next. He replied that he doesn’t know yet. I suspect he may have several options; I’ll be very excited to hear what he chooses.